6-Bottle Wine Rack is rated 4.8 out of 5 by 11. Rated 5 out of 5 by Sissywest from Bought two I needed a wine holder for a small bar cart. This fit and worked perfectly. Also bought one for the top of my fridge. Rated 5 out of 5 by Dlf2014 from Great Wine Rack! This wine rack is perfect for a small space. Looks stylish and does not take up much room. Holds just enough bottles for entertaining, etc. Rated 5 out of 5 by ZenDancer from A Great Versatile Product This is such a versatile product; I love it. 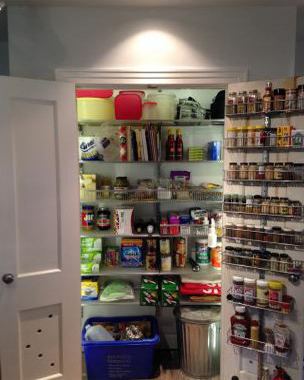 One neat advantage is that you can buy as many as you need to fit the space you have! I wanted to put my wine into one empty shelf in a deep bookcase near the dining table, so I bought 3 units and popped them in. (If my wine cellar expands, then I'll add another shelf!) Suddenly, I have a built in wine rack. If you don't have need for a wine rack, then they can be used in the guest powder room to hold a few rolled up hand towels! So if I change my mind, the rack has other uses. Rated 5 out of 5 by HBBlonde from Perfect for our situation These racks are great. They look nice enough to "out", but were very affordable. We purchased three of them and have them lined up side by side, so they look like a wide 18-bottle rack. We had a defined space that had walls on each side, so being able to build this in a quasi-modular fashion was good for us. Rated 5 out of 5 by beekeeper from Fantastic Wine Rack This wine rack is wonderful, just large enough for my kitchen area. Doesn't take up alot of room and is very classy looking. Would highly recommend to anyone with a small wine collection. Rated 5 out of 5 by RockStar from Great product for small spaces Great product for small space. I used this for on top of my kitchen cupboards. Fit perfect. Rated 4 out of 5 by Nicole from Looks good on the counter, but not perfect I have this and I like it, but it doesn't break down to store away when you don't have wine you want on display, so that's a con and it holds the wine at an angle down toward the cork, so if you recork an open bottle it can cause it to leak onto the counter sometimes. But I love the look and its good if you have just a handful to show. Can this wine rack store larger bottles of wine or champagne? This product is not compatible with larger wine bottles.